Click here for a line art version of this photo that you can color! I've become quite enamored with sous vide cooking. It's foolproof (with a good recipe) and much of the cooking is hands-off. Just put the food in the bag (with or without seasonings or other stuff), seal it, and drop it in the pot. Set the and temperature, and you don't have to think about it until it's done. Much of the time, I cook the food and then refrigerate it until the next day, when I sear or broil it to get some browning on the outside. And of course, this also heats it up to serving temperature. 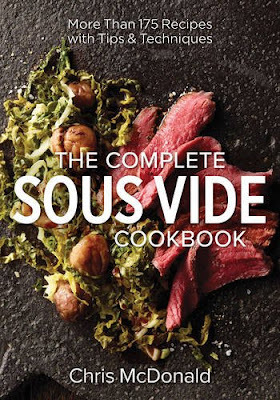 This time, my sous vide cooking was inspired by a new cookbook, The Complete Sous Vide Cookbook by Chris McDonald. Since the recipes are soooo easy, you're getting both a beef roast and some dulce de leche. I hadn't heard of the author before, so I was wasn't sure how reliable the recipes would be. Sous vide cooking isn't like any other method when it comes to temperature and timing, so that's why it's a good idea to start with a good recipe, before you wander off on your own. In this case, I actually did do some wandering. The recipe was designed for a prime rib roast, but I cooked a New York strip roast instead. I figured it wouldn't be too terribly different, since it's a tender roast that could use the same kind of cooking. Turns out, I was right. It was just as tender as when I've done rib roasts. The one thing that's a little different with this recipe is that you preheat the water to a hotter temperature, then lower the temperature for the cooking time. I've never done that before - I usually just put the food in the water bath and let it heat up to the cooking temperature before I start timing the cooking. I don't know if this method made a difference in the final product, but it worked well, and it made sense. When the cool roast went into the hot water, the temperature dropped to close to the final cooking temperature, so it was ready to start the timing. Preheat the water bath to 190 degrees. Meanwhile, rub olive oil over the roast and season with salt and pepper. You could also use another spice mix or rub. I actually used a seasoning that's made by my local butcher shop. Place the roast in the sous vide bag and vacuum seal. Put it in the water bath, reduce the temperature to 134 degrees, and cook for 9 hours. Remove the pouch from the water and let it stand for 20-30 minutes, then remove it from the pouch, pat dry, and season with salt and pepper. Refrigerate fro 20-30 minutes. Note: I just chucked mine in the refrigerator and seared it the next day. By the time it was browned, it was warmed to a decent serving temperature. Preheat a grill to medium-high (I used a cast iron frying pan). Put the roast on the grill and brown on all sides. Transfer to a cutting board and slice against the grain. Click here for a line art version of this photo you can color! If you've ever looked at recipes where you're supposed to put a whole can of condensed milk in a pot and cook it ... and you've wondered if that's a safe and sane thing to do, this method of making dulce de leche is pretty foolproof. Just transfer one can of sweetened condensed milk (NOT evaporated milk!) to a sous vide bag and seal (don't vacuum it into your machine - just get most of the air out and then seal it). I tried this method with plain sweetened condensed milk , and with chocolate sweetened condensed milk. Both worked fine. Heat the sous vide bath to 200 degrees. Place the bag in the water and cook for 8-10 hours. I tried both 8 hours and 10 hours, and didn't see a difference. So cook it for however long is convenient for you. Remove the bag from the bath and transfer the dulce de leche to a storage container. I found the easiest way to get the dulce de leche out of the bag was to snip a corner and squeeze it out as soon as it was reasonable to handle. If you wait until it's room temperature, you can still squeeze it out, but it's pretty thick, so it's not as easy.